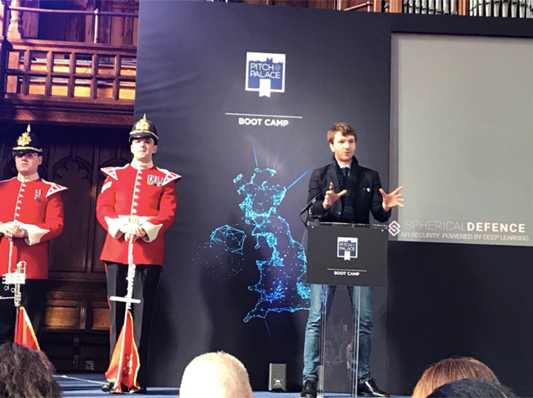 The Boot Camp was held at the University of Manchester’s prestigious Whitworth Hall, and participants were welcomed with introductions from HRH Prince Andrew and the President & Vice-Chancellor of the University, Dame Nancy Rothwell. Throughout the day entrepreneurs were treated to valuable advice from industry leaders at Facebook, IBM and the BBC. Then came the main event – the pitch competition. The contest featured 42 start-ups, each given 3 minutes to pitch (all before the dreaded trumpet sounded to indicate times up!) and was moderated by our Director Gary Stewart, who provided key insight and challenged the entrepreneurs to push their pitches to the next level. The winners were selected from a judging panel consisting of academics and senior business leaders and included 4 teams from our Cheltenham-based GCHQ cybersecurity accelerator programme. HRH Prince Andrew made it clear that at St James’ Palace, there would be a host of people that could help them support their businesses. Supporters and Elevators in the room said the day was enjoyable, engaging and indicative of how Wayra UK is known in the ecosystem. Our winner’s included: Vchain, Razor Secure, Secure Code Warrior, Spherical Defence, OurPath, Valerann and Trust Elevate. Next stop the palace; we’ll be there to cheer them on.